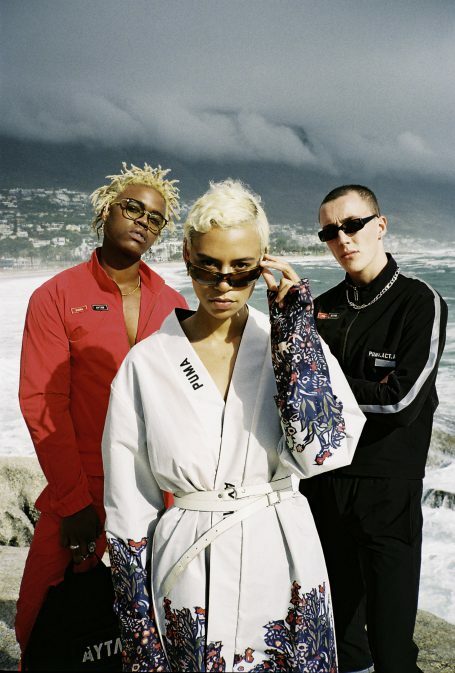 PUMA diversifies its Autumn-Winter ’18 Select lineup by partnering with up and coming fashion brand Outlaw Moscow (a.k.a AYTΛO). Born out the streets of Russian capital and founded in 2014 by designer duo Maxim Bashkaev and Dilyara Minrakhmanova, Outlaw Moscow | AYTΛO is the progressive brand that have multiply times participated in Paris and Milan fashion weeks, shot the Outlaw Film that won the SHOWStudio Film Award and the Outlaw Film 2 together with legendary photographer Nick Knight, the brand dropped several secret parties in Moscow and established the reputation as an independent brand that stands for diversity and freedom. The debut PUMA x Outlaw Moscow | AYTΛO collection incorporates the unique and eclectic influences. It’s a fusion of streetwear and high-end fashion, grime and luxury. It consists of distinctive Russian design elements: minimalistic branding where PUMA is translation in Cyrillic – ПYMA alongside with Moscow famous logo AYTΛO – a phonetic transcription of “Outlaw” word in Cyrillic. The styles have implementation of industrial design elements with combination of elegant floral prints from Russian retro illustration books, adding crisp color-blocking that is inspired avant-garde art legacy , coming together in an eye-catching, provocative and complex collection. The first drop features footwear, appareal and accessories with traditional Russian flower print, embroidery, bright colour blocking and unexpected material combinations to unite national inspired motives. It celebrates the festive and rich Russian culture right in the heart of Moscow where the much-anticipated football tournament is happening this summer. Key footwear styles include the Trailfox Graphic O. Moscow, a lifestyle iteration of the performance trail runner. This sublime version boasts of a all-black premium soft leather embroidered with the traditional Russian floral art on the lateral side. In contrast, it’s finished off with hiking hardware details and an aggressive train inspired chunky rubber sole. The white version comprises of a rubberized color-blocked panels on the lateral sides and padded woven blocking on the medial side. The Avid Zip Graphic O. Moscow follows the same colour and pattern story. The black colourway features an elevated mid-cut boot silbouette, woven jacquard upper with traditional Russian art, completed with a large rubberized zipper on forefoot. The pinnacle apparel piece is the PUMA x O.MOSCOW Kimono that continues with the floral print theme. It has a loosed and elongated fit and is accented by the PUMA Logo and Cyrillic text that translates to “Made in Russia.” The PUMA x O.MOSCOW Bomber features Russian flower graphics placed as a sublimation print. A small AYTO wordmark is printed on the chest. “Made in Russia” Cyrillic text also finishes the contemporary style. As a homage to the game of football, the collection includes a knitted fanwear PUMA x O.MOSCOW Scarf with jacquard wording on both sides and a PUMA x AYTΛO woven label. Backpack, cap and beanie round up the collection, all bearing the disctinctive AYTΛO embroidery label. The first drop pre-releases on July 6th on Outlaw.ru and worldwide on July 14th in leading sneaker retailers, PUMA.com and PUMA stores.